Reagent reservoir. Multichannel & ELISA. Reagent saving. CappOrigami reagent reservoirs represent a new way of thinking when it comes to reagent reservoirs for multichannel pipettes. They are packed, shipped and stored as flat sheets of polypropylene (PP), significantly saving on storage space. 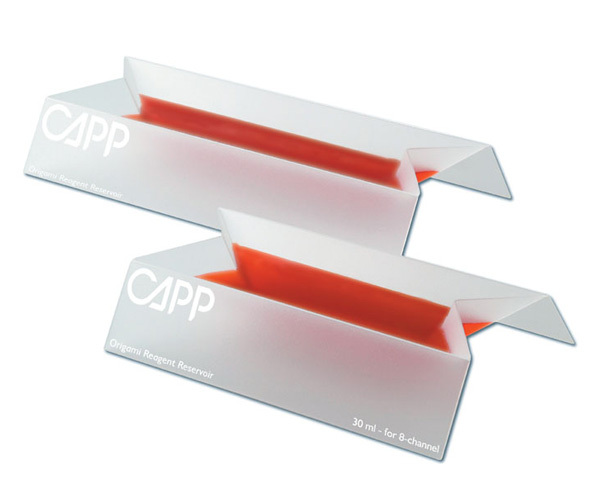 CappOrigami can be used as ELISA reagent reservoir and they are the perfect choice as reagent reservoirs for multichannel pipettes. You can choose between the 30mL multichannel reagent reservoir, which is perfect for the 8 or 16 channel pipettes, or the 40mL multichannel reagent reservoir, suitable for the 12 channel pipettes. To use CappOrigami multichannel reagent reservoir, simply flick it up by pushing the sides together. The unique construction of CappOrigami will form a V-shape container, which makes pipetting easier and enables picking up the very last drops of the reagent. This way you can use your reagents much more efficiently, compared to standard reservoirs available on the market. CappOrigami are offered as sterile, packed in small bags with 5 pcs. only and non sterile with 50 pcs. in a bag. Get free samples of CappOrigami environmentally and storage friendly multichannel reagent reservoir and save bench space and money.